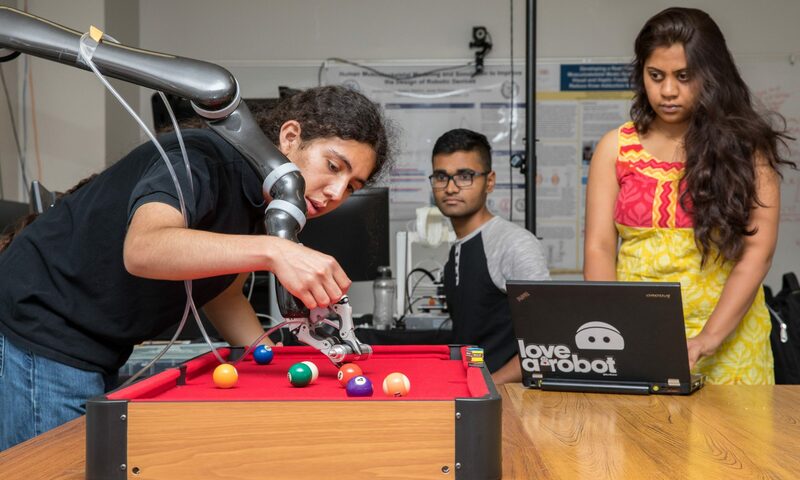 CSULB engineering freshman Zoe Smith went to last month’s MESA Conference hoping to learn about leadership and connect with future employers. She didn’t realize she’d end up winning the video-pitch challenge, which came with a $1,000 prize. Smith was among 14 CSULB students who attended the MESA Student Leadership Conference Oct. 27-28 in downtown Los Angeles. The event connects hand-picked engineering and computer science students with industry professionals to develop the next generation of STEM leaders. The conference gives MESA students an opportunity to interact one-on-one and in small groups with company executives, engineers, and recruiters. Many attendees leave with internship offers that lead to full-time employment. Students also participate in mock interviews and workshops in communications, team building, emotional intelligence, and financial literacy. In the video pitch challenge, students receive 30 minutes of coaching from industry judges, then deliver a pitch to the audience about what they believe in as a person, student, and a young mind in STEM. The Mathematics, Engineering, Science Achievement (MESA) program guides diverse students from underrepresented backgrounds into STEM careers. The CSULB MESA program is housed in the College of Engineering. Both students and companies benefit from the conference: students from throughout the state network and gain the soft skills needed to be well-rounded employees; companies gain access to talented, diverse candidates for internships and employment. This year’s partners and sponsors included Edison, Southern California Gas Co., Applied Materials, ecmc Foundation as top sponsors, and Applied Materials, ecmc Foundation, Pacific Gas & Electric, and San Diego Gas & Electric. Other participating companies were: AT&T, Blast Motion, Boeing, CHC Consulting, Crane Aerospace, Disney, NASA Jet Propulsion Lab, Northrop Grumman, Oracle, and Wells Fargo.